To provide extraordinary camping opportunities for children and to be a valued resource to 4-H, youth, families, groups, and organizations throughout the region. 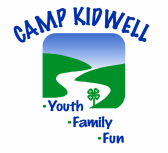 4-H Camp Kidwell is a non-profit youth camp in Bloomingdale (Southwest), Michigan. We offer a wide variety of programs including: summer camp, team building/School, community events, facilities rentals, and so much more. Please check out the site and hopefully you find all the information you are looking for, but if you have questions or need more information, please "contact us" we would LOVE to hear from you! Fun and Excitement is awaiting!!! Allegan County 4-H Clubs Annual meeting will be held on Saturday, April 27th at 4pm at 4-H Camp Kidwell. Share in camp activities and enjoy a campfire. 4-H leaders will vote on proposed By-Laws and new board members. There will be complimentary hot dogs and yummy s’mores! Get updates of the happenings here at Camp Kidwell.​ Sign up for our mailing list.